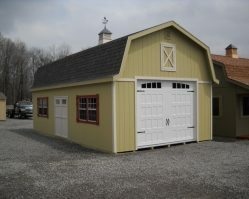 Our Dutch style garages include one 36” entry door, two 24” x 36” windows, and one 9′ x 7′ insulated steel garage door. 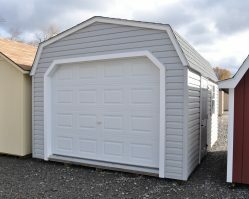 These garages are available in sizes ranging from 12’ x 16’ through 14’ x 40’. 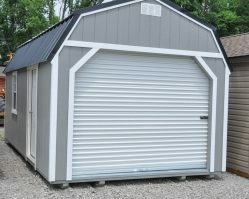 Available in the Peak style as well as the Dutch style with your choice of 6 different sidings: Vinyl, plywood backed Duratemp, LP Smart Side, Board “n” Batten, Shiplap Cedar, or Log Siding. 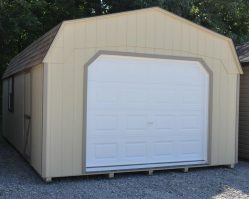 Exterior walls built of kiln dried 2×4’s spaced 16” on center (with the exception of board ‘n’ batten siding where the 2×4’s run horizontally 24” on center) give you lots of hanging storage space or ample interior shelving room for all those small trinkets. Double top wall plates interlocked at the corners provide sturdy straight walls. The floor is constructed of ¾” pressure treated plywood placed over pressure treated 2×4’s spaced 12” on center over 5 pressure treated 4×4’s running the length of the structure. Rent TO Own $219.00 Per Month. ..Rent TO Own & 12 Months Same as Cash Available..